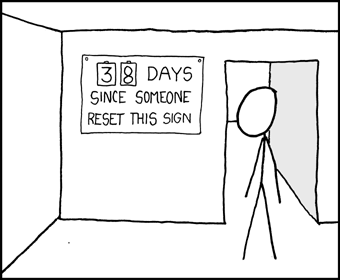 It has been 213 days, 3 hours, 28 minutes and 39 seconds since someone reset this sign. On average, it has been reset every 37 days, 8 hours, 59 minutes and 37 seconds. Since the beginning in September 2008 the sign has been reset a total of 98 times.